The grant was originally due this upcoming Thursday, but with the government shutdown showing no signs of ending, who knows what will happen? The National Science Foundation’s website is unavailable during the furlough, meaning that nobody can submit applications. So we’ve all been granted an unexpected extension, but we’re not sure until when. The grant I’m applying for is called the Doctoral Dissertation Improvement Grant. It’s an opportunity for Ph.D. students to acquire funding to add on a piece to their dissertation that they wouldn’t otherwise be able to do. I’m applying for funds to go down to South Africa and work with a couple of folks from the conservation organization Panthera to collate data from two sites with long-term carnivore research projects. Their research team currently has camera surveys laid out in two reserves in Kwazulu-Natal, South Africa: Phinda Private Game Reserve and Mkhuze Game reserve. Now, the cool thing about these reserves is that they are small, fenced, and pretty much identical to each other…except that lions have been deliberately excluded from Mkhuze. Now, one of the biggest frustrations of working with large carnivores is that I can’t experimentally isolate the processes I’m studying. If I want to know how lions affect the ranging patterns and demography of hyenas, well, I should take out all the lions from a system and see what happens to the hyenas. For obvious reasons, this is never going to happen. But the set-up in Phinda and Mkhuze is the next best thing: by holding everything else constant – habitat, prey – I can actually assess the effect of lions on the ranging and dynamics of hyenas, cheetahs, and leopards by comparing the two reserves. 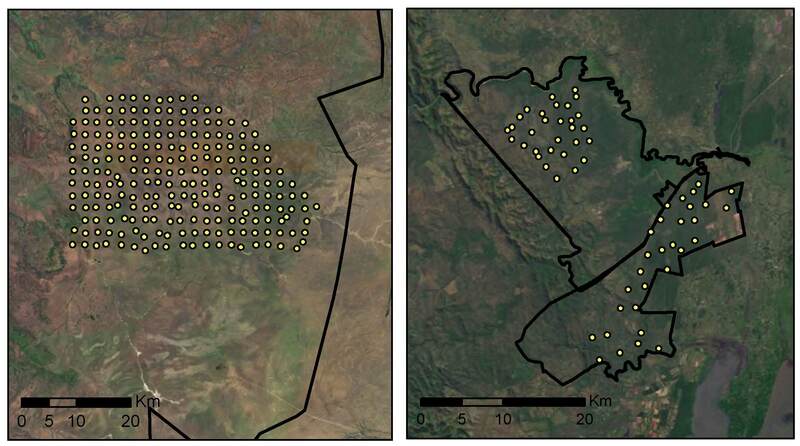 Camera surveys (yellow dot = camera) in Serengeti (left) and Phinda/Mkhuze (right). So, that’s what I’m working on non-stop until whenever it turns out to be due. Because this would be a really cool grant to get. I’m currently working on analyzing some of the camera trap data from Seasons 1-4 and hope to share some of the results with you next week. Until then, I’m going to continue to be a bit of a zombie. I hope you get the grant, with the world getting smaller its important to know how these smaller reserves work. Mkhuze is a wonderful place, lush and green and instead of all those wildebeest you will have kudu and nyala!